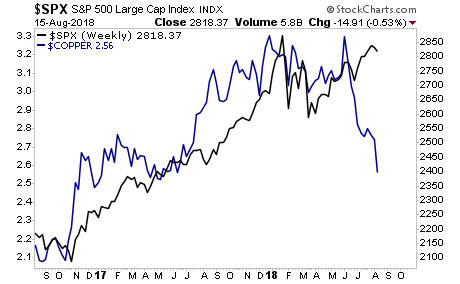 Will Stocks Play "Catch Up" To Copper? Yesterday’s sell-off gave stocks a confirmed breakdown from the rising wedge they’ve formed since early July. At the very least, we should see a correction down to the lower line of the trend channel running back to April. However, if we are to go by economically sensitive commodities such as Copper, stocks could drop a LOT more than this. The charts are clear here… the global growth story is over. 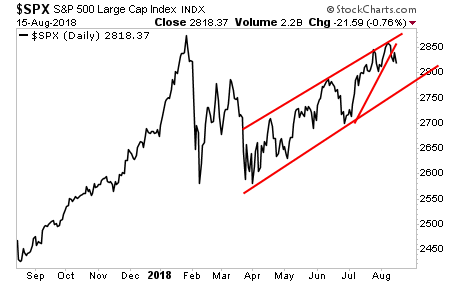 The issue is now whether US stocks play “catch up” or not. On that note, our proprietary Crash Trigger recorded a signal yesterday morning. This means the odds of a market meltdown are higher than in years. And we just published a 21-page investment report titled Stock Market Crash Survival Guide. Today there are just 37 left.